The title is from a Wallace Stevens poem “A Primitive Like an Orb” – a poem that has provided me with many titles. In my yard the heavy snow brought nature to the table. 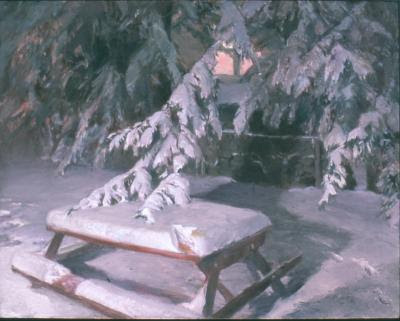 In order to create a human presence at the table with nature, I scooped out the snow on the top and the seat and added footsteps behind the table.